489 Wellington Street West Toronto is a mesmerizing condominium, currently in a preconstruction phase. This project’s development has been undertaken by Lifetime Developments. With a stunning view and at the same time giving you a homely feel, this project offers everything that you would dream of and presents you with a qualified and dignified developer who can give the place an urban style with a classic touch, both interior and exterior. 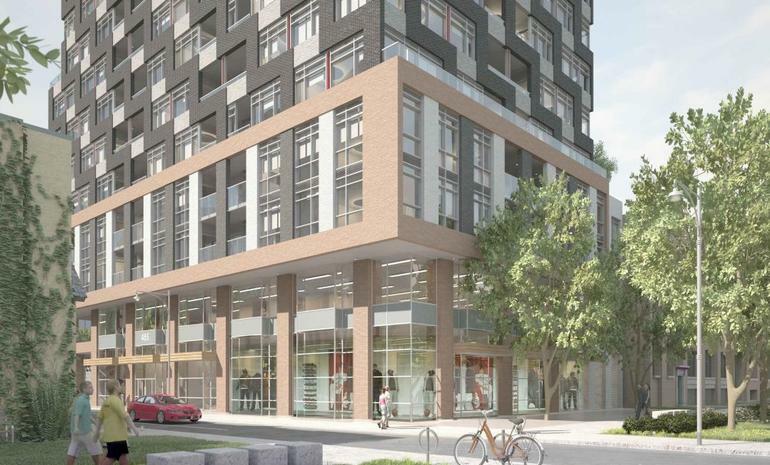 The project offers 489 Wellington Street West 136 units and 16 storey buildings. Getting a walk score of 93, a transit score of 100 and a bike score of 73, this place is also a perfect fit for people who have to travel more often. Since this project is situated in Wellington Street, the major street in Ottawa has many historical stories attached to it. 489 Wellington Street West amenities include everything from outstanding transportation system to educational buildings to bars and restaurants. Bus stops like Union Station Bus Terminal (2.1km), Toronto Coach Terminal (2.7km), Standard Parking Bus Station (3.4km) are quite near to the project. Railway stations are also found nearby. Some of the closest ones include – Union Railway Station (1.4km), Exhibition Railway Station (3.1km) and Kipling Railway Station (15km). Navette pour Bishop Airport (1.5km), Toronto Airport (1.5km), Porter FBO Limited Airport (2.0km) and Billy Bishop Toronto City Airport (2.0km) are some of the famous airports nearby. 489 Wellington Street West Toronto ON is situated on the Wellington Street itself and therefore proves to be most advantageous in terms of location. It offers all types of locational advantages that not only fulfil the needs but wants too. For hospitals, you could go to Emkiro Health Services (1.7km), Infinity Health Centre (1.6km), Medcan (1.8km) and Patient Networks Family Medicine Walk-In Clinic (2.6km). Some privileged educational institutes like SoHo Metropolitan School, Thompson Toronto School, can be found within the radius of 1km only. For leisure purposes, there are parks like Wychwood Barns Park(5.6), Trinity Bellwoods Park (2.3km)and High Park (7.7km). For pharmacies, you could walk off to Shoppers Drug Mart (1.2km), and Loblaws pharmacy (3.1km). 489 Wellington Street West location contains every medium for entertainment and fun. There are malls – Dufferin mall, First Canadian place and CF Toronto Eaton Centre; restaurants include – Hotel Ocho, The Rex Hotel Jazz and Blues Bar, Hotel Novotel Toronto Centre, The Drake Hotel and Gladstone Hotel; also movie theatres such as – Tiff Bell Light Box, The Royal and Imagine Cinemas are places which can be found easily. Half House, Escape Casa Loma-A Secret City Adventure and Camera Wall are the famous tourist attractions, found nearby. This condominium is under the development of Lifetime Development, which has brought innovation in their commercial as well as residential buildings for the past three decades. The Lifetime Developments projects, with their par excellence and experience, have proved everyone that with the right mixture of talent one could achieve heights in less time. They have brought a change in the lifestyle of people by their impeccable designs and keeping a match with the urban environment.